The BAAF is fast becoming a force for good in the publishing world! Their books, whilst aimed at children who are being fostered or adopted, are often of use to many other children as well. This one is a case in point. Rufus, a tortoise-shell cat, has been adopted by a family who are kind and loving. But Rufus has had a bad experience. His first family shouted and sometimes didn’t feed him and were very unkind. This means that Rufus’s behaviour can be challenging to his new family, and it takes time for him to feel safe and cared for. When he finds a blue velvet cushion and it becomes his special place, he is able to remember the bad memories without feeling afraid of them anymore – and he learns to eat things other than pilchards! 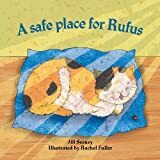 While Rufus is a child in disguise, he is believable as a cat too, and the charming pictures of him – lovable even when he is unhappy and misbehaving – show us how to love even those who can be unlovable. There is a leaflet at the back of the book for parents and carers to use when reading the book with a child. It gives gentle, leading questions to help get the most from the story.